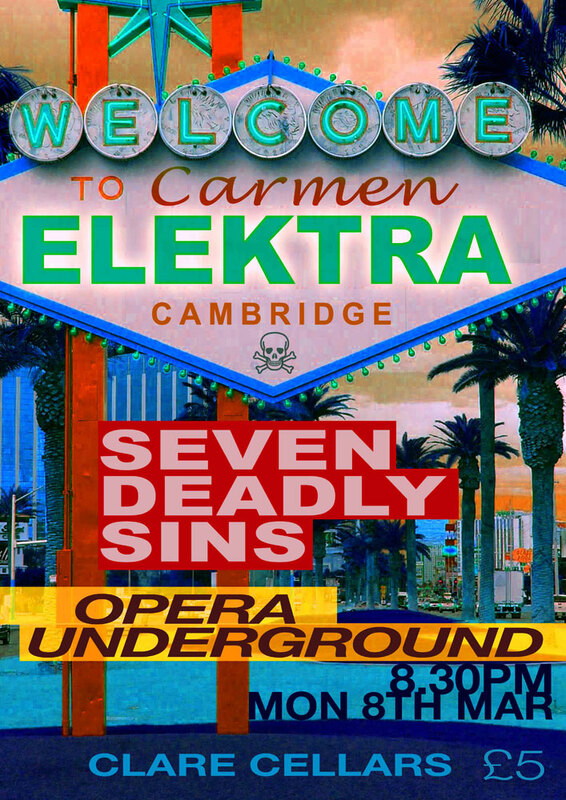 On Friday 17th June in a large, condemned warehouse space, remarkably well-hidden considering its proximity to Cambridge city centre, our opera company Carmen Elektra is hosting its third ‘opera club-night’. Two new works by local composers, one of which is a world premiere, are being staged within a night of DJ sets and general ambience, with the intention of making the very most of a remarkable, and conclusively doomed, performance setting. A sci-fi dance opera about the tragedy of matter. Ssol, a glamorous computer scientist, discovers a frequency that will destroy her own physical form and break into the next dimension. She builds an army of hysterical dancing bodies: as they stamp and scream the particles disperse, and the Universe begins to tear apart. A video opera for narrator, musicians and electronics first performed at the Spitalfields Festival. A multi-sensory journey into realms of super-linguistic sound and super-sonic language, navigating and atomising the aural landscape of deep summer. Our aim is to rehabilitate opera by dispensing of its many cultural and aesthetic trappings and focusing on productions that are relevant to youth and popular cultures as well as the culture of contemporary art music. To this end, Carmen Elektra has developed the ‘opera clubnight’ – an evening of short, accessible and engaging operas interspersed with DJ sets of multi-genre electronic and experimental music, and inspired by a unique and unconventional performance location. This format can act as an impetus to re-discover the theatrical potential of familiar or forgotten works for a new venue and a new audience. The opera clubnight demands creativity and innovation in its production and presentation, whilst simultaneously challenging ideas surrounding genre, performance and society in both performers and audience. Rather than trying to wring contemporary relevance from a pre-existent repertoire, we focus on alternative, modern works, in English, which will work effectively in unconventional stagings and appeal to young and non-‘initiated’ audiences. We believe that, of all contemporary art music, it is opera that has the most immediate interdisciplinary appeal and the greatest potential to engage with today’s broader artistic and cultural climate. There are several British opera companies at the moment doing their best to reform the art-form, while many of the bigger institutions are also consciously addressing these same issues from season to season. Amongst these, Carmen Elektra aims to stand out by focusing on new and modern works, and by curating for each new event and venue a site-specific themed programme which encompasses the operatic works themselves as well as other media installations. Our real desire is to start from a point which is always theatrical, drawing on the most audacious of modern theatre and not comprising on these elements for the sake of musical predominance. The freedom that this approach entails should create artistic opportunities, rather than limit them. The addition of the ‘club-night’ element, designed to relocate the paradigm of performances from the world of formal theatre to the world of the nightclub – which is essentially an immersive, pan-sensory ‘total theatre’ domain – is at once an attempt to welcome alternative audiences and an attempt to merge discrete ‘works’ and artistic ‘disciplines’ into one evening-long ‘happening’, which is united around a central theme. In order to explore to the fullest those capacities of opera that we feel have gone previously untapped, we try to draw such themes from ideas and concepts particular to popular and modern culture, be it tabloid celebrity worship or trashy horror movies. It seems like a very good time to mention another young opera company who are wrenching the genre in exciting directions: Go Opera. These guys are similarly focusing on the theatrical potential of opera in intimate surroundings, creating an ‘immersive’ experience with an informal, accessible ambience, in exciting venues. They’re currently revving up for a seven-show run of Go Traviata! – a ‘bitesize…walkabout-style’ version of the Verdi work – in a secret warehouse location near Hackney Wick station. And, all of the shows are now sold out. Go Opera’s direct attempts to take on the opera houses by reclaiming ‘canonical’ works – ‘we choose the best bits of the best operas’, they claim – are perhaps more immediately comparable to the phenomenally successful productions of OperaUpClose at the King’s Head Theatre. By tackling well-known works, these companies can make direct statements about the way opera is performed, whilst maintaining the advantages of a repertoire proven to attract a certain audience however it is presented. 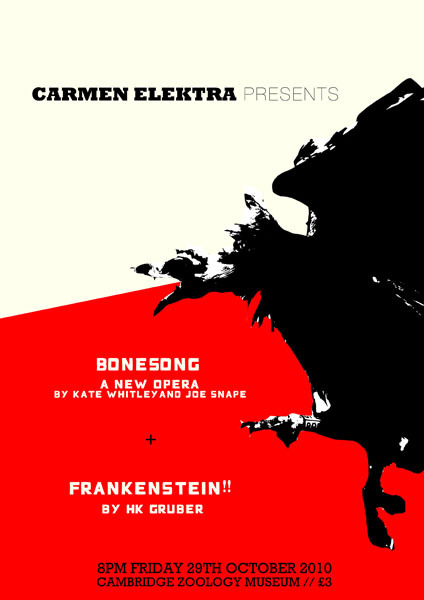 Using familiar works is a good way of building publicity and easing existing audiences into these kinds of ventures, but eventually what Carmen Elektra would aim to achieve is to build up a body of bespoke works written especially for these conditions, not just tailored versions of larger works. This is partly, in line with the biting point manifesto, a bid to keep new art at the centre of musical culture, but also to encourage writing which can engage directly with the kind of performance possibilities opened up by these ‘alternative’ formats – far more flexible than the necessarily grand, necessarily large-scale, necessarily expensive dimensions of any new opera house commission. This entry was posted in club-night, electronic, opera. Bookmark the permalink.